Do you want to hear our news as it happens? Then tune into our RSS News Feed. The latest release of Caedium (v2.1) now supports Mac OS X 10.5 (Leopard) and 10.6 (Snow Leopard) in addition to Windows and Linux. Also in this new release are various enhancements to 3D selection, the properties panel, and geometry creation for all platforms. Caedium RANS Flow can now export results in file formats supported by popular 3rd party visualization tools. We have renamed SymLab to Caedium after a request from the trademark holder of Symlabs. Functionally Caedium is identical to SymLab. We are pleased to announce the release of Caedium (v2.0.1), which includes the world's first automated simulation telemetry system for posting images to TwitPic and posting associated messages (tweets) to Twitter. This new feature is useful if you want to check on the progress of a Computational Fluid Dynamics (CFD) simulation while you are away from your simulation's host machine and you have access to Twitter. 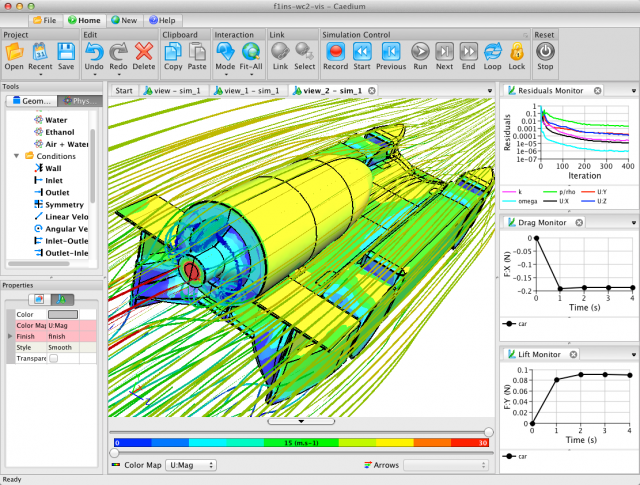 It is also a great way to share CFD simulation progress with other colleagues on Twitter in real-time. As of October 23, 2009 this offer is no longer available. Beat the imminent Caedium Professional add-on price increase to $999.99/year due to the inclusion of the Caedium RANS Flow add-on. Buy now at only $299.99/year - that's a 70% discount - and receive the Caedium RANS Flow add-on as a free update once it's released. Racecar Engineering, the International Journal of Motorsport Technology, recently used a Caedium diffuser simulation (shown below) in "Diffusers Explained" by Lawrence Butcher. Diffusers are a hot topic at the moment with the ongoing Formula 1 diffuser controversy. See how Caedium, our unified simulation environment, and its add-ons (e.g., Caedium Professional) compare to other Computer-Aided Engineering tools in the "Computer-Aided Engineering at a Glance" table within the Desktop Engineering (September 2008) article "Analysis Meets Design" by Laurie Toupin. We are pleased to announce our latest Caedium release (v1.2) now supports Linux as well as Windows. 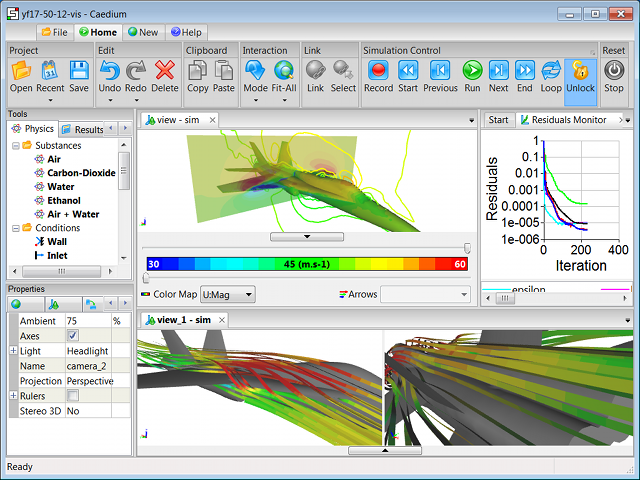 Caedium is a unified simulation environment which can be extended using add-ons, such as our Professional add-on, into a complete Computer-Aided Engineering system for fluid flow analysis. 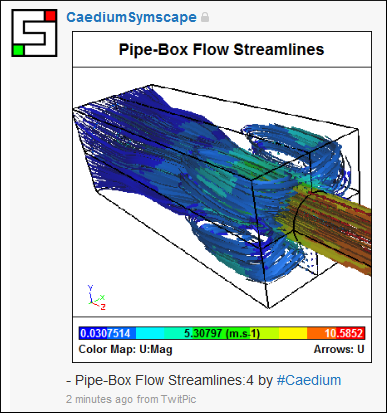 Symscape and Caedium recently hit the headlines in an article by Jeffrey Rowe for Cadalyst entitled Analysis for the Masses with CAE 2.0. The article draws parallels between the Web 2.0 movement, typified by websites such as YouTube, and our Computer-Aided Engineering for All mantra.